Our DC Motor Controllers are ideal for marine and wet-location applications. Other uses include electric vehicles, machine control, assembly lines, and high volume pumps. Our direct current motor controllers are designed for all brushed DC motors, including brushed permanent magnet motors. Available IP-68 enclosures allow operation in the harshest environments -- even underwater. Intended for severe duty applications, such as electric cars, winches, material handling equipment, and marine applications. 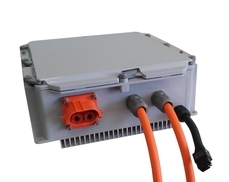 Wide voltage input range available in a single unit (24 to 380 volts). OEM version of 1000-amp controller for most brushed DC motors. All our controllers feature pre-installed, water tight motor and battery cables/connectors, for fast and easy installation. Plug-and-play firmware allows immediate use of our controllers, without the need for programming or setup.